The 2013 World Baseball Classic (WBC) was an international professional baseball competition, held from March 2 to March 19, 2013. This was the third iteration of the WBC, following the two previous tournaments, held in 2006 and 2009. Unlike the two previous WBCs, which consisted of the same sixteen countries, only the twelve countries that won at least one game in the 2009 WBC were guaranteed a berth in the main tournament. The automatic qualifiers were Australia, China, Cuba, Dominican Republic, Italy, Japan, Mexico, the Netherlands, Puerto Rico, South Korea, the United States, and Venezuela. Four qualification brackets were held in late 2012 and respectively won by Canada, Taiwan, Spain, and Brazil, who joined the WBC as the final four teams (the latter two making their Classic debuts). As in the 2006 tournament, the first round had a round-robin format, which led to South Korea being eliminated on a run difference tiebreaker. Venezuela also failed to advance out of a tough group. The fourth-place teams in each group – Brazil, Australia, Spain, and Mexico – will have to participate in the qualifying round in order to return for the 2017 tournament. The second round was a modified double-elimination format, as in the 2009 tournament, where the modification was that the final game of each bracket was winner-take-all, even if won by the team emerging from the loser's bracket, although that game only affected seeding as two teams advanced from each bracket. The Netherlands improved on its surprising 2009 run by advancing to the semifinal game, as did two-time defending champion Japan. However, the two-time defending champions Japan were eliminated in the semi-finals game against stunning Puerto Rico. In the final game, the Dominican Republic defeated Puerto Rico to become the first WBC champion from the Western Hemisphere, as well as the first team to complete the WBC with an undefeated record. Robinson Canó was named the Most Valuable Player of the Classic. 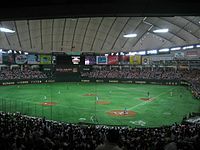 The preparations for the third World Baseball Classic were complicated by a dispute between the Japanese Professional Baseball Players Association (JPBPA), the union for all Nippon Professional Baseball players, and MLB over revenue sharing. JPBPA demanded a larger share of advertising and merchandise sponsorship revenue for the tournament, a large chunk of which came from Japanese companies. MLB resisted the move in part due to the fact that the World Baseball Classic is a joint production of MLB and the MLB Player's Association, meaning that those two organizations bore the cost of the tournament. In July 2012 the JPBPA voted unanimously to boycott the 2013 World Baseball Classic. The move was interpreted by some news outlets as a non-final decision, aimed at raising the pressure on MLB. In September 2012, Japanese players agreed to take part after reaching a compromise with tournament organizers on sharing sponsorship and licensing revenue. Although the 2006 and 2009 editions of the World Baseball Classic were contested by the same pre-selected field of 16 teams, for the 2013 tournament only the 12 teams that won at least one game in 2009 were guaranteed a berth in the main tournament. The automatic qualifiers were Australia, China, Cuba, Dominican Republic, Italy, Japan, Mexico, the Netherlands, Puerto Rico, South Korea, the United States, and Venezuela. The other four teams from the 2009 tournament (Canada, Taiwan, Panama, and South Africa) contested a qualifying round in late 2012, along with 12 additional teams invited by the International Baseball Federation (IBAF). The qualifying round was organized as four independent modified double-elimination tournaments. The modification was that the final game was winner-take-all, even if won by the team emerging from the loser's bracket. Although this modified double-elimination format was used in some rounds of the 2009 World Baseball Classic, in that tournament the final game was only for seeding and never for elimination. As practiced in the 2013 qualifiers, the team emerging from the winner's bracket might be eliminated from the tournament despite losing only one game (as, in fact, happened to Israel in Qualifier 1). The composition of the qualifying pools was determined based on geographical location, competitive balance, and regional rivalries. [dead link] In Qualifier 1, South Africa took on France, Israel, and Spain, with the games taking place in Jupiter, Florida, United States. In Qualifier 2, Canada took on the Czech Republic, Germany, and Great Britain, with the games taking place in Regensburg, Germany. In Qualifier 3, Panama took on Brazil, Colombia, and Nicaragua, with the games taking place in Panama City, Panama. In Qualifier 4, Taiwan took on New Zealand, the Philippines, and Thailand, with the games taking place in New Taipei City, Taiwan. Canada and Taiwan dominated Qualifiers 2 and 4 (respectively) to advance easily. In Qualifier 1, South Africa was eliminated in the second round, and Spain narrowly defeated Israel to advance to the main tournament. In Qualifier 3, Brazil narrowly defeated Panama to earn the final berth in the main tournament. Under WBC rules, non-Israeli players of Jewish ancestry were eligible to play for Israel, and Major League All Stars first baseman Kevin Youkilis, second baseman Ian Kinsler, and outfielder Ryan Braun (whose father is Israeli) expressed a desire to do so. However, Qualifier 1 took place in September, during the MLB season, precluding the participation of those major league players as well as Jewish major leaguers catcher Ryan Lavarnway, first baseman Ike Davis, third baseman Danny Valencia, outfielders Sam Fuld and Ryan Kalish, and pitchers Jason Marquis, Scott Feldman, Craig Breslow, and John Grabow. Without its Major Leaguers, Israel, coached by former major league All Star Brad Ausmus, was evenly matched with Spain. It narrowly failed to qualify for the main tournament despite 4 home runs in 12 at-bats from minor league first baseman Nate Freiman. Canada similarly was unable to utilize its Major League players, including Joey Votto and Justin Morneau, as Qualifier 2 also took place in September. However, Canada easily qualified anyway. They were led by minor league first baseman Jimmy Van Ostrand (.538; 10 RBIs in 13 at-bats). By contrast, all four teams in Qualifier 3 boasted Major League players, as it took place in November and did not conflict with the MLB season. Panama had five established Major Leaguers, and Nicaragua two. However, Brazil won the qualifier despite playing only one Major Leaguer, rookie Yan Gomes. Although Qualifier 4 also took place in November, Taiwan did not play its available Major Leaguers, but easily qualified anyway. In the first round, each team played the other three teams in its pool once. Teams were ranked by winning percentage in the first round, with the top two teams in each pool advancing to the second round. There, the teams from Pools A and B (in Pool 1) and the teams from Pools C and D (in Pool 2) competed in a double-elimination format. The top two teams in each pool in the second round entered the four-team single-elimination semifinals. The four qualifying teams crossed over for the semifinals, with the winner of each pool playing against the runner-up from the other pool. In the final, the team with the higher winning percentage of games in the tournament were to be the home team. If the teams competing in the final had identical winning percentages in the tournament, then World Baseball Classic, Inc. (WBCI) would conduct a coin flip or draw to determine the home team. Drawing of lots, conducted by World Baseball Classic, Inc. (WBCI). The deadline for submitting provisional rosters was January 16, but teams had until February 20 to finalize their roster decisions. Many Major League Baseball (MLB) players participated. The United States provisional roster was made up entirely of players from MLB, and champions Dominican Republic provisional roster had only one player not signed to an MLB team in 2013. The Canadian team had 12 players who appeared in MLB in 2012. Japan had none and two prominent Japanese MLB players, Yu Darvish and Ichiro Suzuki, chose not to play. Though five members who competed for the Cuban national team in the 2009 WBC have since defected, the Cuban team was considered strong despite its 2nd-round sacking. Three members of MLB.com's Top 100 prospect participated: Xander Bogaerts, Eddie Rosario, and Jameson Taillon. The top 12 teams that participated in the 2009 World Baseball Classic were invited back for the 2013 tournament. Spain, Canada, Brazil, and Chinese Taipei won their pools of qualification. NOTE: Tiebreaker notes: HTH − Head-to-head. RS − Runs scored. IPO − Innings the team batted. RA − Runs against. IPD − Innings the team pitched. TQB − The index of (RS/IPO)−(RA/IPD). Organizer WBCI has no interest in the final standings and did not compute. So, it was calculated by IBAF for the IBAF Men's Baseball World Rankings. Note: The tournament Most Valuable Player was Robinson Canó. If a pitcher reached his limit during an at bat, he was allowed to finish pitching to the batter, but was removed from the game at the end of the at bat. For purposes of the pitcher use limitation rules, both semifinal games were to be deemed to have been played on the day of the latest semifinal game. A mercy rule came into effect when one team led by either fifteen runs after five innings, or ten runs after seven innings in the first two rounds. Instant replay was also available to umpires during the tournament. As was introduced in Major League Baseball during the 2008 season, replays were only used to adjudicate on home run decisions, to determine whether the ball was fair or foul, over the fence or not, and the impact of fan interference. An alternative version of the IBAF's extra inning rule was also used. If after 12 innings the score was still tied, each half inning thereafter would have started with runners on second and first base. The runners would have been the eighth and ninth hitters due in that inning respectively. For example, if the number five hitter was due to lead off the inning, the number three hitter would have been on second base, and the number four hitter on first base. However, this rule was never actually employed in this year's Classic, as the only extra-inning game in the tournament ended prior to a 13th inning. MLB Network has been announced as the English-language broadcaster of the 2013 and 2017 tournaments. ESPN Deportes provided Spanish-language coverage, and ESPN Radio had audio rights. Sportsnet was the broadcaster in Canada and ESPN America in United Kingdom, Ireland and other parts of Europe. ^ The game was originally scheduled to be played at Salt River Fields at Talking Stick, but was moved due to potential inclement weather. ^ a b c Belson, Ken (June 1, 2011). "Israel to Participate in 2013 World Baseball Classic". The New York Times. Archived from the original on July 11, 2011. Retrieved July 16, 2011. ^ Schlegel, John (March 20, 2013). "Torrid stretch earns Cano Classic MVP". MLB.com. ^ Coskrey, Jason (July 21, 2012). "JPBPA unanimously votes to boycott WBC". The Japan Times. Retrieved August 13, 2012. ^ "NPB players decide to sit out upcoming WBC". Daily Yomiuri Online. July 21, 2012. Retrieved August 13, 2012. ^ Martin, Alexander (July 20, 2012). "Japanese Pros Threaten to Boycott World Baseball Classic". Wall Street Journal. Retrieved August 13, 2012. ^ "Japan threatens to boycott World Baseball Classic". Sports Illustrated. July 20, 2012. Retrieved August 13, 2012. ^ "Japan agrees to play in 2013 WBC". ESPN. Associated Press. September 4, 2012. ^ a b "2013 World Baseball Classic Field expands to 28 Teams". IBAF. June 1, 2011. Retrieved June 1, 2011. ^ Fordin, Spencer (July 25, 2012). "reporter". MLB website. MLB Advanced Media. Retrieved November 18, 2012. ^ "World Baseball Classic: Israel squad could be dangerous with stars Ryan Braun, Ian Kinsler available". Sporting News. Associated Press. May 21, 2012. Archived from the original on November 25, 2012. Retrieved March 12, 2013. ^ "Jews to Play in Baseball All-Star Game". Shalom Life. July 10, 2010. Archived from the original on November 6, 2013. Retrieved March 20, 2013. ^ Belson, Ken (June 1, 2011). "Israel to Participate in 2013 World Baseball Classic". The New York Times. Retrieved July 16, 2011. ^ "World Baseball Classic: Israel, managed by Bra". Sporting News. May 21, 2012. Archived from the original on May 23, 2012. Retrieved March 14, 2013. 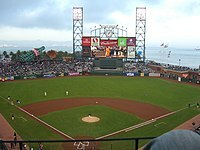 ^ "Israel invited to qualify for World Baseball Classic". JTA. June 2, 2011. Retrieved June 2, 2011. ^ Jeremy Fine. "The Great Rabbino". Retrieved July 16, 2011. ^ Aaron Yellin (June 7, 2011). "Israel to Participate in 2013 World Baseball Classic". The Forward. Retrieved July 16, 2011. ^ "Panama City set to host World Baseball Classic qualifying action". World Baseball Classic. November 14, 2012. Archived from the original on February 9, 2013. Retrieved March 12, 2013. ^ "World Baseball Classic Tournament Rules and Regulations". Secure.worldbaseballclassic.com. Archived from the original on April 12, 2013. Retrieved March 12, 2013. ^ "International venues set for 2013 Classic". Retrieved September 25, 2012. ^ "The 2013 World Baseball Classic is ready to go". Retrieved December 2, 2012. ^ See: 2013 World Baseball Classic – Championship#Final – Dominican Republic 3, Puerto Rico 0. ^ Dittmeier, Bobbie (October 23, 2012). "MLB Network to air all Classic games in '13, '17". MLB.com. Archived from the original on November 2, 2012. Retrieved October 23, 2012. ^ gabriela nunez on January 13, 2013 (January 13, 2013). "ESPN Selected to Present Spanish-Language Multimedia Coverage of 2013 and 2017 World Baseball Classic « ESPN MediaZone". Espnmediazone.com. Retrieved March 12, 2013.